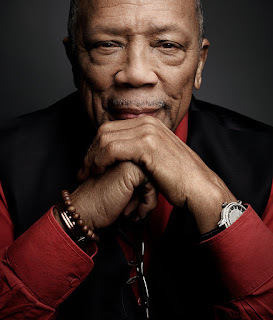 I have to admit I didn't know a whole lot about Quincy Jones, despite a love for just about all music. I knew he was an acclaimed producer and arranger, of course, but just how amazing his career in music has been had somehow escaped me until I read this interview in Vulture with Jones (which eventually led me to this one). His low first impressions of the Beatles and JFK assassination conspiracy theory aside, the man is fascinating. I'm floored by the thought that Q has worked with Ray Charles, Sarah Vaughan, Count Basie, Gene Krupa, Dizzy Gillespie, Frank Sinatra, Ella Fitzgerald, Lesley Gore, Herbie Hancock, Michael Jackson, Milton Nascimento, Bono, Miles Davis, and of course so many more musicians. He's clearly got a gift and it goes way beyond having produced Off the Wall and Thriller and Bad and "We Are the World." He's also got a myriad stories to tell; I can't imagine meeting him at a party and wanting to talk to anyone else there. Dude's friends with Oprah, Spielberg, Paul Allen, and, um, Cosby. His humanitarian work is admirable, too. He's played with, produced, and/or seen some incredible musicians. And I missed a lot of that. Gotta make up for it, starting with picking up Gula Matari, I think. And "Q: The Autobiography of Quincy Jones," though it's apparently not all written by him, and probably in need of an update considering it was published in 2001.